The espresso wooden beams are extraordinary in this home renovation! Along the landing, our Seattle Bar system looks strong and professional in this installation. 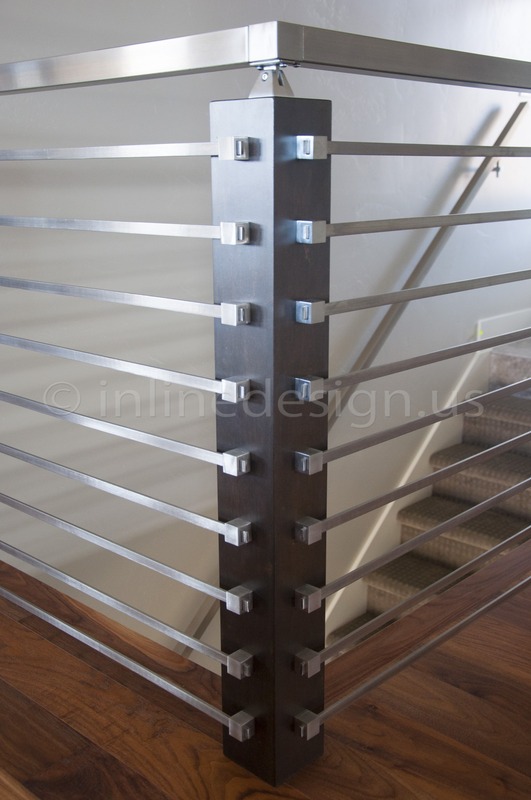 Rather than purchase the appropriate posts, Angela installed bar holders with 9 spans of the solid stainless steel horizontal bars for the landing. One of the most unique (and also more challenging) applications of the pyramid bracket for square posts is to actually carve out the wood to accept the tight fit. These pyramid brackets offset square tube top rail and are flush and sturdy to support the weight. Stainless steel square tube runs down the wall on wall mounted brackets. On the last three steps, space opens up for the tube to make a 90 degree turn right with the flush angle 90 degree, connecting to the lower stair bar system using 36″ posts where the bar holders were mounted at an angle on-site to allow for the run of the stairs.